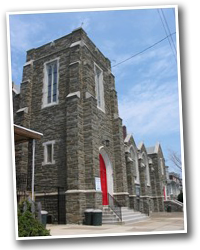 The intent of the following is to bring about the planting of a new multi-ethnic church in the Feltonville neighborhood of Philadelphia, building upon the history and investment of Wyoming Avenue Baptist Church. This church will be committed to the community of Feltonville. This will be an intentionally multi-ethnic church. Reflecting the planting church, this new church will identify with the Evangelical Free Church of America (EFCA). We believe that the gospel of Jesus Christ is powerful to transform people in our community. There is transformative power in the gospel. Observationally, we see that people are open to the Gospel and willing to learn more about God, draw closer to Christ, and freely expose their children to the church. There is opportunity for gospel ministry in Feltonville. However, Wyoming Ave. Baptist Church is in many ways disconnected from its community, without significant transformative impact. There are barriers to effective ministry, some which can be identified, but many which cannot. Many in the church do not live in the community. The church largely reflects a singular white culture in a diverse neighborhood. In its dwindling state, the church is effectively run by just a few families. The church cannot afford to hire a pastor. We believe that the creation of a new church can create a new context for Gospel ministry that can provide more fertile soil for the effective spread of the Gospel in Feltonville. New wineskins are needed for this new wine! A new core group will be formed locally. Multi-ethnic leaders will be identified, trained, and empowered for ministry. With a new beginning, we hope that the whole of the church will be involved in its leadership, ministry and outreach. With the support of partner churches, we hope to call full-time church planters to invest in a new work in Feltonville. All present services, classes, ministries, and other activities will stop, with a final worship service on October 23, 2011. Active members will be given letters of transfer. Assets will be transferred to Grace Church of Philly, to be used in trust solely for the planting of a new church in Feltonville. The new church will start on Sunday, November 20, 2011. Initial services are expected to be at 10am in the annex (“The Gathering”), with small group Bible studies (“Grace Groups”) on Wednesday night. Members of Wyoming Ave Baptist will be invited to remain and invest in the forming of the new church, becoming members of Grace Church of Philly. The church will tentatively be called “Grace Church Feltonville,” and will operate under the leadership of Grace Church of Philly. Pastor John Davis and the leadership team of Grace Church of Philly will work to form partnership with the Evangelical Free Church of America and other EFCA churches to invest in the new work, and call pastors and/or church planters to lead the church. Grace Church of Philly will form a provisional leadership team in Feltonville, initially to consist of Joey Muñoz, Walt Rice, Jr., and Theodor Yonkeu. The church will incorporate and come under its own constitution and bylaws. The church will have a distinct membership. The church will seek affiliation with the Evangelical Free Church of America. All assets from the original Wyoming Ave. Baptist that were transferred and held by Grace Church of Philly will be transferred to the new church. The next step is for the congregation to consider, discuss, and vote to approve or reject the plan for replanting. This will occur at a special congregational meeting, held on Sunday, October 16, following the morning worship service. If the congregation votes (by 2/3 majority of those present and voting) to dissolve the church according to this plan, it will go into effect immediately thereafter, with a final service held on October 23, 2011. Services under Grace Church’s leadership would begin on November 20.